The Second Age: Are the Democrats Trying to Lose in November? Are the Democrats Trying to Lose in November? I wrote last week on the Huffington Post about how the Tea Party has the potential to energize both the Republican base and the Democratic base this November. The movement is scary, not only from a xenophobic standpoint but also a policy one (or lack of policy), and the prospect of someone like Christine O'Donnell walking the halls of Congress just might be enough to get Democrats out to vote Democratic in an election cycle when, in all honesty, Democrats have not proven themselves worthy of our votes. You hear that Democrats? Stop whining. And when you're done whining, vote for us! I don't know if Biden knows this, but we're not a group of sadomasochists who enjoy being spoken to like kindergartners who want one more cookie before dinner. I'll break down three reasons why Democrats are "whining." This was a huge promise by Barack Obama, and on his second full day in office he signed an executive order stating that, "The detention facilities at Guantánamo for individuals covered by this order shall be closed as soon as practicable, and no later than 1 year from the date of this order [January 22, 2009]." We're coming up on midterm elections and Gitmo remains a black eye on this country. One of the first things Obama set out to do failed. For me, at least, Guantanamo was one of the biggest things I was looking forward to seeing dismantled under Obama. Now, I'm not holding my breath. I spoke about this at the beginning of August. We've been in Afghanistan for nearly nine years and I've yet to hear a clear goal for the country. 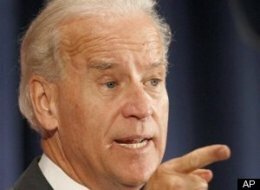 It's been war-torn for decades now, yet Biden has previously stated that we're not there to nation-build. The COIN strategy, as Rolling Stone pointed out, has been a failure up to this point. And Robert Gates, when given the explicit chance to tell the nation what we aim to do in Afghanistan chooses to remain as vague as possible. Let's be clear: if we do not nation-build in Afghanistan, we will never leave (and if we do it will be a mistake, just as it was post-Soviet Afghan War). If we cannot provide the country with stable infrastructure (political and otherwise) it will always remain a decentralized haven for extremism. But without clear goals, there's nothing towards which to work. One of the main focal points of Obama's campaign was bipartisanship. He was going to reach across the aisle with an olive branch and everyone was going to work together. The result? Everyone called everyone else a Nazi, blocked as much legislation as possible, watered down the health care bill and the financial reform bill, and left constituents holding the bag. It didn't help that Obama brought in the polarizing figure of Rahm Emmanuel as his chief of staff. But beyond all of this, Obama tried way too hard to work with Republicans once it became painfully obvious that their main goal was obstruction. Instead of trying to pass legislation with just the Democrats, he kept going after "broad bipartisan support." That's a great way to kill bills. What he should have done was put bills to votes, allowed Republicans to filibuster or block them in some other way, and then highlight their obstructionism. Instead, he kept trying to work with them and has little to show for it except plunging poll numbers. Obama's certainly done some good things in office, but he has not lived up to all of his campaign promises. To call those who expected him to stay true to his word "whiners" and tell us he's kept his promises is insulting to our intelligence. Luckily for Democrats, the alternative to them is a Republican party that either has less accomplishments than Democrats for the past two years (unless you count making sure nothing gets done an accomplishment) or individuals who would not be out of place preaching on subway platforms about the evils of Washington in between feeding their twenty feral cats. When I voted for Obama in 2008 I was refreshed because it was one of the first votes I had cast that I did not have to rationalize as a lesser of two evils. Sadly, we have returned to this scenario for the midterm elections.